You are here: Home / Criminal Law / Court / How can the State charge me if there is no proof? Can the State charge me without proof? So someone has accused you of wrongdoing, but has not presented any evidence, what now? How can the State charge you with a crime when it is just one person’s word against yours? Don’t they need evidence? Isn’t what they say about me ‘hearsay’? It is all just ‘he said, she said’! I get these questions a lot from clients and prospective clients. These issues demonstrate a misunderstanding of what ‘evidence’ is. the state tries to use the person’s out of court statement against you without calling that person into court. If the individual says they witnessed the crime, and they come into court and testify about what they witnessed, then it is no longer a hearsay statement. Second I want to talk about ‘evidence’ and ‘live testimony’. Evidence is anything the state presents that makes it more or less likely that a fact is true. Live testimony in court is evidence. It is possible to be convicted by testimony alone. The state can bring in a witness, have that witness testify in open court under oath, and present that witness’s testimony, and nothing more. That may be a weak case for the state. In most cases, arguing to the judge for a dismissal of the case because the state did not present ‘evidence’ is typically a loser argument. Many people do not understand how the criminal justice system works. When the State charges you with a crime, you are charged by the prosecuting attorney. The judge does not charge you, and the judge does not normally decide what the ‘facts’ are in a criminal case. 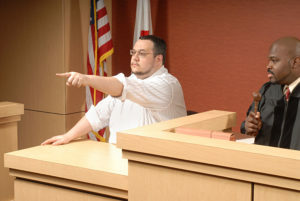 The jury decides the facts and decides whether to acquit a defendant or find him guilty. On the other hand, a judge decides evidentiary issues, and would certainly believe that a witness’s live testimony of a crime, is relevant evidence for a jury to hear. You will have to argue your case to the jury. You will also have to claim that the State did not present enough evidence to prove their case beyond a reasonable doubt. This cannot be argued to the judge unless you choose a bench trial where the judge is the trier of fact. In that case, the judge will still be able to hear the live testimony as evidence. Then decide whether he or she believes the witness. The State can charge you with a crime based on what one person says. Do not plan on going to court with the belief that all you have to tell the judge is “it’s their word against yours,” and so the court should dismiss the case. Saying it’s all “he said, she said,” isn’t going to be enough to dispose of the matter. Do not think that they cannot proceed because they only have one witness. In most cases, they can, and they will. You need to start preparing your defense. The fact that the State has only presented one person’s testimony against you, and no other evidence, is a proper argument to make to the jury. It goes to the weight of proof. It indeed isn’t a slam dunk case for the State when the only evidence the State presents is one person’s word. In some cases, you certainly have a good chance of arguing a winning case to the jury, especially if you can call the witness’s credibility into question. Just make sure you understand that that’s what you are going to have to do. You cannot just walk into court and ‘tell the judge.’ If you think that’s your plan, then you will go to court unprepared to defend your case. Contacting a criminal defense attorney will be in your best interests.